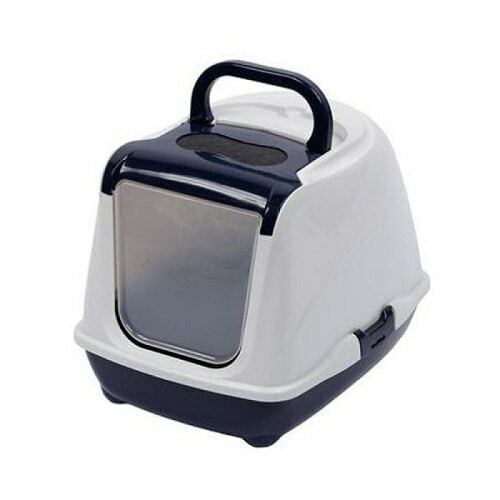 Covered Cat Litter Tray from Moderna with a flip top, easy carry handle and a translucent door for added privacy. 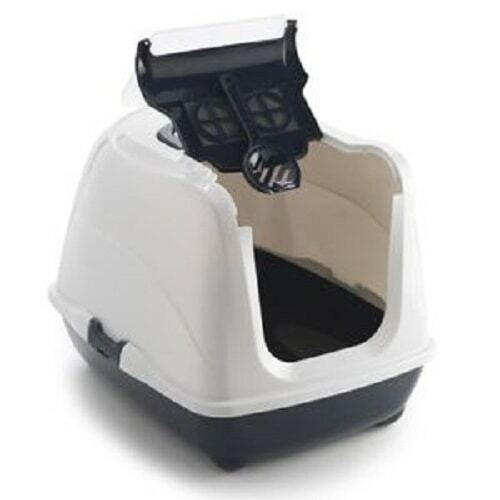 Covered Cat Litter Tray from Moderna with a flip top enclosed cat litter box. It also has a top handle for easy carrying and a translucent door for added privacy. The deep plastic base is easy to clean and helps reduce scatter. The covered cat litter tray from Moderna includes one charcoal filter which helps to eliminate odours. The flip top is an innovative design which allows the door and top to flip up revealing a litter scoop for easy cleaning. All you need to do is simply remove the litter scoop and clean as normal then replace the scoop and flip the top back down. On the side of the base are two latching locks to keep the litter box secure.